John Richards met Joanne Eicher at the University of Illinois, Champaign-Urbana. After they graduated in 1963, they were married. 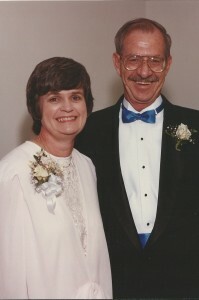 They were a hard-working, middle class parents who raised two children in Illinois and Texas. John worked hard in various jobs in sales and customer service over the course of his life. In his free time, he loved to play golf and was an avid model railroad fan. He always found space to have his trains in his home, even if it was the basement or garage. In his home in Pantego, Texas, he devoted a whole bedroom to his trains and town layout. Joanne was a homemaker, Girl Scout Leader, PTA President and officer in her women’s golf league when their children were younger. Once her children were older, she began to go back to work and eventually went back to school. She earned a Master’s in Accounting from University of Texas at Arlington and became a Certified Public Accountant. The John and Joanne Richards Fund was established by their children Bob Richards and Sandy Barber to honor the values and lessons they learned from their parents and to sustain Sandy’s passion and mission for serving children who come from hard places. Sandy became the Executive Director of the Fannin County Children’s Center in 2001. She and her brother Bob credit their parents with teaching them the values of hard-work, honesty, integrity, kindness and compassion for others. Their parents also regularly demonstrated a deep desire and willingness to always go above and beyond the call of duty in service to others, while expecting nothing in return.